Dr. Rania Georgei is proud to offer high quality general and cosmetic dental care to the families of Murrieta, CA as well as the surrounding areas of Bear Creek and Wildomar, CA. Whether it is a cleaning, teeth whitening, emergency services or Invisalign that you are looking for, Dr. Georgei and her team are up to date on the latest techniques to provide you with treatments that are long-lasting and comfortable in a cost-effective manner. Dr. Georgei understands the importance of a healthy smile and consistently strives to give the patients of Copper Canyon Smiles beautiful, natural smiles that they can't help but show off. Murrieta CA DentistDr. Georgei received her Doctorate of Dental Medicine (DMD) from the prestigious University Of Pennsylvania in 2004. While in training she served in a dental mission in Philadelphia and participated in externships at the Philadelphia VA Medical Center and The Children’s Hospital of Philadelphia, PA.
Before that, she received her Bachelors Degree in Oral and Dental Medicine from Cairo University in Cairo, Egypt in 1995. While there, she completed a yearlong residency program in general dentistry and oral surgery. Dr. Georgei has extensive training and experience in cosmetic dentistry including veneers, Lumineers and invisible braces (Invisalign). She is committed to spending several hours of continuing education and workshops every year in the field of restorative dentistry. 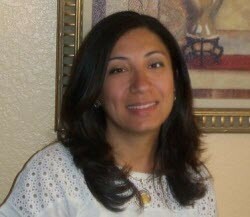 She had been practicing in Riverside, CA since 2005 and joined Copper Canyon Smiles in 2006. In 2011, Dr. Georgei became the owner and the sole provider at CCS. Dr. Georgei works full time at Copper Canyon Smiles and provides flexible hours in order to accommodate each of your family members’ busy schedules. Owning her own practice is very important to Dr. Georgei because she strives to provide the best care for her patients without any compromises. Because Copper Canyon Smiles is independently owned and operated, she does not have to answer to a large corporate body about profitability, sales figures, cost containment and other issues that come with corporately managed dental offices. Having served our community since 2006, Dr. Georgei has hundreds of healthy, beautiful smiles to her credit and has become a trusted source of care in the Murrieta, CA area. Dr. Georgei is very personable and treats all of her patients as family members and friends. She is always complemented by her patients for her gentle touch and approach. Once our patients receive dental care from Dr. Georgei and Copper Canyon Smiles, many of them refer their friends and family to our practice. We consider that to be the highest compliment we can receive about our service, and see it is as a mark of our commitment and level of care.